Discover the beauty and convenience of a HomCom free standing electric fireplace and enjoy warmth and comfort without all the work of a traditional unit. Our maintenance-free fireplace is clean and cost effective, offering a warm glow without emissions or expense. With two heat settings and an LED flame effect with adjustable brightness, we offer an authentic experience in a modern, efficient package. 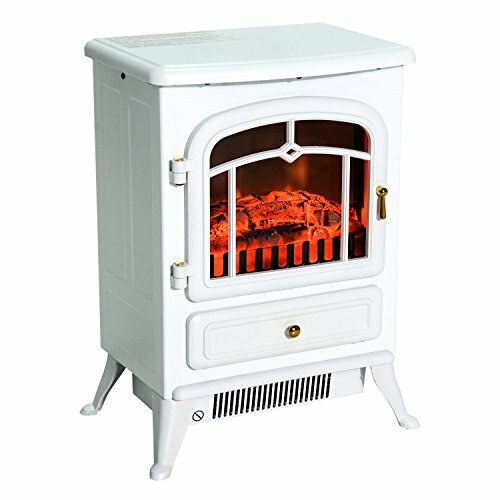 - Power Cord Length: 59"
- Tempered Glass Thickness: 0.12"
✔ STYLISH AND PORTABLE: Elegant freestanding design electric fireplace heater with classic metal finish and copper effect handles - great for the home, garage and workplace. ✔ REALISTIC LOG FLAME EFFECT: Use it with the heat function or independently for an attractive visual, providing the ambiance of a gentle rolling fire all year long. ✔ ADJUSTABLE HEAT SETTINGS: Features 2 heat settings (750W/1500W) with an adjustable thermostat control for optimum comfort that you can control. ✔ SAFE FROM OVERHEATING: A thermal safety cut off switch is included to prevent the appliance from overheating and turns the fireplace off should it happen to fall over. ✔ BUDGET-FRIENDLY, MAINTENANCE-FREE: Our fireplace is a cost-effective, clean-energy alternative, providing the warmth and visual ambience of real flames, but without the cost and clean-up.